Simon Ireland has worked as an English teacher for 35 years and brought many poets into schools for workshops, Book Weeks and the like. Now he has published a collection of his work for 7-13 year olds, with the aim of entertaining and educating young readers. Each poem is matched by questions designed to prompt pupils to think about the meaning in the verses and explore the ideas in them more widely. The book has been designed to encourage youngsters to read more widely and even have a go themselves. 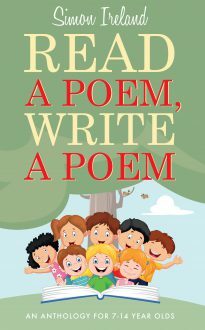 An entertaining and instructive introduction to poetry for youngsters.